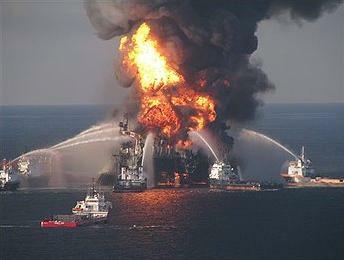 Tragedy in the Gulf: Rush to Judgment? HomeBusinessTragedy in the Gulf: Rush to Judgment? “This stuff is damn hard and very dangerous,” says our resident oil patch veteran Byron King, reacting to news that searchers have given up hope the 11 people missing from an oil rig in the Gulf of Mexico are still alive. ﻿It was just a few weeks ago that Byron suited up for a visit to an offshore drilling ship operated by the same firm Transocean. “I saw safety up close and personal. I had to go through two days of safety training just to set foot near the helicopter, and just to go out and set foot on the rig. After the training, I sat for specific safety briefs about the helicopter rides, as well as more safety briefings about shipboard operations. This is what they do. This is how they do it. So I know that safety is a value at Transocean. “Mr. Beevers,” Byron explains, “is referring to six workers who died as a result of an April 2 explosion and fire at Tesoro’s Anacortes, Wash., refinery. Three more workers were injured April 14 at Exxon Mobil’s Baton Rouge, La., refinery fire. Another worker was killed April 19 due to a crane accident on the Motiva Enterprises expansion project in Port Arthur, Texas. “Based on my inspection of the Discoverer Inspiration a few weeks back, I disagree with Mr. Beevers’ assertion of a ‘lack of a safety culture.’ I saw just the opposite. Then again, we’ve got a sunken rig, and 11 missing workers. Something went wrong.